Yesterday was my the 17th birthday of one of my best friends, Heidi. Our friendship fascinates me because it is in so many ways atypical: it started with utter dislike, was never anything but long-distance, and these days we talk so rarely that we should grow apart but we never do. Heidi and I met at summer camp at the University of Oregon in 2008. That’s roughly 5 1/2 years ago, and she’s the only person who I’ve remained close to for that long EVER. I’m not one of those people who had a childhood best friend that remained into adulthood, and I (unfortunately) tend to move on from people relatively quickly. But that wasn’t the case with Heidi, and maybe it is partially due to our unusual circumstances. When I first met her, I hated her. And here’s why: I thought she was way cooler than I was. And I wasn’t wrong, she was way cooler than I was. And for classically misguided 12-year-old reasons, I was angry that she already seemed to have life figured out even though I didn’t, despite being two years ahead of her in school. She had an impeccable style (no other person I know could pull off the color combinations that Heidi did in 2008), she was funny and likable, and she just overall gave off the impression that she had her act together. The natural reaction to someone like that, of course, is to disguise your jealousy with undeserved hatred. I told myself that because she was cool that she was arrogant and had a superiority complex. All I can say is thank goodness for the UO sprinkler system that caught the two of us in a surprise shower while walking on campus. We were startled and disoriented, and Heidi yelled out, “Go! Save yourself!” as I navigated myself out of the downpour. When she emerged from the sprinkler’s flood, we looked at each other and burst out laughing. By the time we arrived back at our dorm hallway, drenched and late for our floor meeting, all my bitter feelings towards Heidi had been washed away. We spent a fair amount of time together at camp, but that isn’t really how we became best friends. Heidi lives in Seattle, three hours north of my hometown of Portland. She and I planned an unexpected twist at our camp friend’s surprise party: Heidi would come down to visit and appear at the party to add to the shock factor (I later found out that not only had someone ruined the surprise of the party for our friend, but Heidi herself disclosed that she’d be coming…sigh, junior high is not a place for secrets). Heidi stayed at my house overnight on the evening of the party, and that night was the turning point in our friendship. We stayed up late, bonding in a way we never did at camp when a hundred other kids were around. 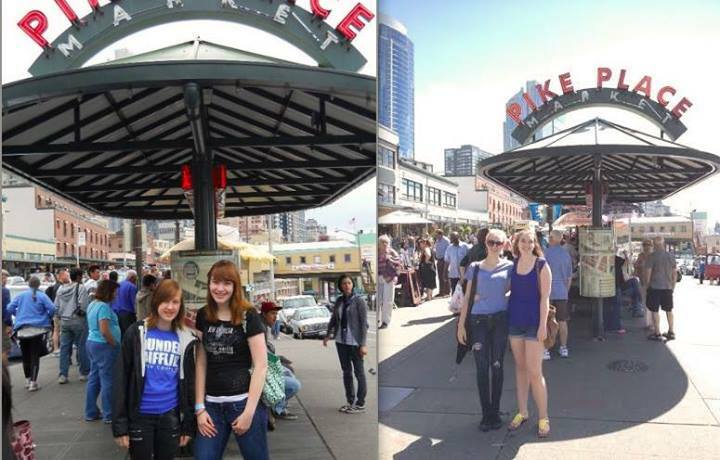 In the 5 years since then, I’ve made numerous vacations to Seattle to visit her. Whether just a weekend or as long as the two weeks she housed me in July 2010, we always spend our time together getting into shenanigans and appreciating our scarce chances to physically be together. We used to grab each other’s hands and say “you’re real” to remind ourselves that being together was rare and not to be taken for granted. Through those trips, I’ve become friends with some of the people she went to school with (she has since moved schools, and when I visit it actually gives her an excuse to reconnect with them). Her house is like a second home to me, and I even helped her family move across town on one of my stays. She is the only person I’ve known for so long, and our unique friendship continues to evolve as we do. We’ve never fought, but we have gone through periods of being too absorbed in our own lives to check in with each other. I’ve seen Heidi at her best and at her worst, but what I really value in her is the comfort of knowing I’ll always have her for support. We’ve always been long-distance, so I knew going away to college that it wouldn’t change our relationship (which has held true, although the time difference does add an additional layer of difficulty, I have to admit). Even if she and I don’t talk for months on end, we return to each other in times of joy and times of need, which always reminds us why we’ve been friends for a significant portion of our young lives. We have certain traditions that I’ll always hold near and dear: my annual gift of a fleece tie blanket for Christmas, playing Pokemon Monopoly and the Sims, eating hum bao from Uwajimaya. We have hundreds of inside jokes and memories that nobody could ever possibly understand. And we have each other, which is all we really need in the end. Here’s to you, Heidi. Happy 17th birthday. Want more stories of friendship around WordPress? Check out the pingbacks on Daily Post’s Something So Strong. Pingback: Welcome Brothers | Views Splash! Pingback: Ode to My BFF | Views Splash! Alli, this didn’t go out in an email/the Reader, did it? The post showed up in my reader…. Hmm. I’m going through old posts and cleaning them up so I hope it doesn’t republish them all to the Reader. I tweeted a different early post earlier so I’m hoping it’s just that.